Follow Author-Poet Aberjhani's board Charter for a More Compassionate World on Pinterest. 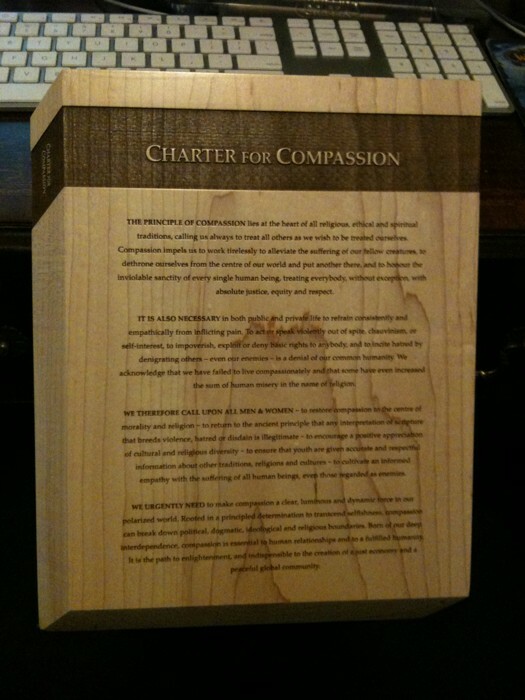 To sign the Charter for Compassion please click this image. A former nun, Armstrong has written two books about this experience: Through the Narrow Gate, about her seven years in the convent, and The Spiral Staircase, about her subsequent spiritual awakening, when she developed her iconoclastic take on the major monotheistic religions -- and on the strains of fundamentalism common to all. She is a powerful voice for ecumenical understanding. Armstrong's 2008 TED Prize wish asked us to help her assemble the Charter for Compassion, a document around which all of us can work together for peace. In late fall 2008, the first draft of the document was written by the world, via a sharing website, and 160,000 people contributed ideas and language. In February 2009 the words of the world were collected and given to the Council of Conscience, a gathering of religious leaders and thinkers, who crafted the final document. The Charter was launched in November 2009. "I say that religion isn't about believing things. It's ethical alchemy. It's about behaving in a way that changes you, that gives you intimations of holiness and sacredness." The Global Compassion Council is the advisory body for the Charter for Compassion. Recruited from around the world, the Council is a confluence of leaders of the movement in the realms of government, business, education, philanthropy, religion & spirituality, health care, the environment, peace, and social justice. The chair of the Council is Rev. Joan Brown Campbell, a devoted activist for peace and social justice. Among many other "firsts," she was the first ordained woman to be General Secretary of the National Council of the Churches of Christ in the USA; and the first woman Director of Religion at the historic Chautauqua Institution, a center for religion, education, the arts, and recreation. The governing Board of Trustees is drawn from the members of the Council. Karen Armstrong, 2008 TED Prize winner, creator of the Charter for Compassion, renowned author on religion, history, compassion. Allan Boesak, minister of South African Dutch Reformed Church cleric, South African politician and politician and anti-apartheid activist. Anil Singh-Morales, religious scholar, business executive, and co-founder of Seattle’s Compassionate Action Network. Rabbi Awraham Soetendorp, human rights advocate, writer, environmental activist and champion of civil society worldwide; leader in global, humanitarian, and interfaith organizations and initiatives. Cynthia Figge, business innovator and leader in movement for corporate social responsibility, co-founder of CSRHub.com. Darshita Gillies, born into the lowest social class (“untouchables”) of a poor non-English speaking conservative Hindu family, had a career as an international banker before founding a chapter of Conscious Capitalism in the UK. Diana Eck, award-winning religion author, professor at Harvard Divinity School, director of the Pluralism Project, chair of Interfaith Relations Commission of the National Council of Churches. Haidar Bagir, Indonesian publisher and educator, president director of Indonesian publisher Mizan Group, professor at Islamic College for Advanced Studies (ICAS) London in Jakarta. Howard Behar, former president of Starbucks International, author of It’s Not about the Coffee. Dr. James Doty, Clinical Professor in the Department of Neurosurgery at Stanford University, founder of Stanford’s Center for Compassion and Empathy Research and Education. Janja Bec, Serbian peace and humanitarian activist and socialogist focused on war crimes and genocide. Jean Zaru, Palestinian Quaker, founding member of Sabeel, an ecumenical Palestinian Liberation Theology Center in Jerusalem; helped establish Friends International Center in Ramallah. Jeff Vander Clute, evolutionary leader consultant to technology startups, nonprofits at the leading edge of social transformation, and global communities of practice. Karoline Klerk, founder of Compassionate Sweden, a non-profit network organization that promotes compassionate strategies in Sweden. Lynne Twist, global citizen, teacher, author of The Soul of Money, co-founder of the Pachamama Alliance, empowering indigenous people of the Amazon rainforest to preserve lands and culture. Magdalena Whoolery, citizen activist and organizer, founder of the Botho Compassion Movement in Bostwana. Michael Wolfe, Muslim American poet, author, Executive Producer of Unity Productions Foundation; author of The Hadj, and One Thousand Roads to Mecca. Monica Neomagus, co-founder of the Dutch Charter for Compassion Foundation, trainer, organizer, social worker. Mussie Hailu, peace ambassador and teacher from Addis Adaba; international advocate and activist for creating a culture of peace, interfaith harmony & cooperation. Professor Nasser David Khalili, founder & chairman of the Maimonides Interfaith Foundation and UNESCO Goodwill Ambassador; world-renowned scholar, collector and philanthropist. Rev. Dr Ofelia Ortega Suárez, minister of Presbyterian-Reformed Church in Cuba, elected member of the Cuban National Assembly, leader in World Council of Churches. Owsley Brown, philanthropist, filmmaker, and activist on behalf of interfaith partnerships and the compassion movement. Peter Storey, former president of the Methodist Church of Southern Africa, past president of the South African Council of Churches, and Methodist Bishop of Johannesburg/Soweto. Chief Phil Lane, Jr., enrolled member of the Yankton Dakota and Chickasaw First Nations, leader in human and community development, Chair of the Four Worlds International Institute (FWII). Robi Damelin, leader and spokesperson for the Parent’s Circle in Palestine/Israel, a peace-making organization composed of parents who have lost their children in the conflict. Robin Youngson, physician and anaesthetic specialist in New Zealand, internationally renowned for his leadership promoting compassion in healthcare. Roshi Joan Halifax, Buddhist teacher, Zen priest, anthropologist, and pioneer in the field of end-of-life care; Founder, Abbot, and Head Teacher of Upaya Institute and Zen Center in Santa Fe. Shainoor Khoja, CEO of Better Business Enterprise, international consultant and director of projects in many countries focused on economic development, sustainable practices, and social justice, including Kyrgyzstan, Maldives, Zambia, Afghanistan, Tajikistan, Syria and the Middle East. Tom Williams, co-host of the Partnership for a Compassionate Louisville; founder and chair of Restorative Justice Louisville, Inc.; past President of the Louisville Bar Association. Tori McClure, president of Spalding University in Louisville, the first university to sign the Charter for Compassion; first woman to row a boat, alone, and without assistance, across the Atlantic. Will Poole, Social Technologist and angel investor, co-founder and Managing Partner of Unitus Seed Fund, former corporate vice president of the Unlimited Potential Group at Microsoft Corp.
Zeid Abdul-Hadi, Co-Founder, Vice-Chairman and Chief Executive Officer of an investment and development company in Amman – Jordan; founder of Charter for Compassion Jordan.